The truck is certainly the warhorse of the automotive world. Whether it’s a semi or a pickup, these vehicles toil day in and day out to facilitate drivers’ diverse needs, from cross-country long hauls to schlepping construction materials across town. And even though trucks are designed for work, they are still vulnerable to the effects of overwork. One common issue that can plague a truck in constant use is foul odor. Yes, over time it’s possible to notice some unpleasant or even downright noxious fumes emanating from the cab of the truck in question. But there’s no need to panic; likely this odor is just the natural result of spending so much time in the vehicle. The above can lead to foul smell that can quickly cross the line into dangerous territory, as gasoline and motor oil spillage can produce quite the noxious fumes. To this end, air fresheners are not enough; the gasoline odor needs to be neutralized at its source. To get rid of the stink it is first necessary to locate the source. That means searching the cab for the stain resulting from any gas or oil spills. Once the source is located, the best plan of attack is to thoroughly clean the area using a strong upholstery cleanser like ODOREZE™ Multi-Purpose Smell Remover Deodorizer/Cleaner. Another tip is too apply some VAPOREZE™ Vapor Absorbing Granules to the spot after washing to draw out and remove the remaining gasoline or oil fumes. After a few hours on the spot, the smell should be history. As mentioned above, trucks are designed for work. And if the person operating the truck has been using it for more hard labor than recreation, well, some residual body odor (bo) from an honest day’s work may linger in the cab. And, once again, oftentimes this beast is no match for a simple air freshener. That’s why it’s best to break out the big guns and use SMELLEZE™ Truck Odor Deodorizer Pouches. These devices are inexpensive (around $12.99), are reusable for years, and don’t require power so can be just left in the cab 24/7. After 12 or so hours of use in a truck cab with the windows rolled up, the job should be done. No shame in grabbing a quick bite to eat while driving; the shame comes later when an errant food wrapper, crumbs, or a spilled drink ferments for days on end and creates stench foul enough to make a person’s head spin. The first thing to do in such a situation is to locate any hidden food and remove it ASAP. Next, clean up spills with ODOREZE™. The rest is a breeze. To remove any lingering smells, scatter SMELLEZE™ Carpet Smell Deodorizer Powder on carpets and seats, leave for few hours, and vacuum. The powder acts as a natural odor vacuum, sucking up foul odor. 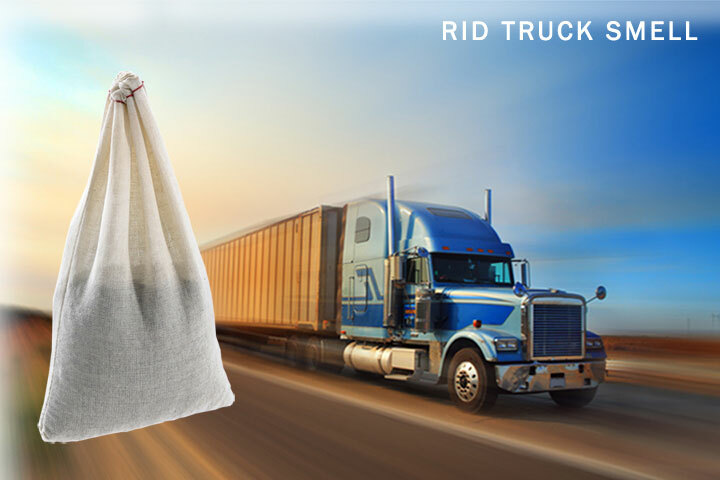 By following the above steps, any truck owner should be able to remove persistent smells from the cab of his or her truck and trailer with relative ease. The best part is that these methods should kill the smells once and for all – until the next burger wrapper gets left under a seat for a few weeks. Sean Clark is the Social Media Coordinator for NextTruckOnline.com, a marketplace for used commercial trucks, used freightliner trucks and more. We have a septic tank in our YMCA that was built in 1964. It’s a 2 story building , but also has a lower floor where our pool filter and pump is located. This is where our septic tank is. Every so often, we get a bad sewer smell that goes throughout the Y. Do you have anything that will help us get rid of this nasty smell? Firstly, I would recommend using Smelleze® Reusable Chemical Smell Deodorizer Pouches to eliminate the sewage odor from the air. Secondly, you can sprinkle Smelleze® Natural Carpet Smell Deodorizer Powder on the floor around the area with the odor and this should rid the odor. 1. Does Smelleze Resusable Dead Animal Smell Deodorizer Pouch applicable to odors of rotten cancer wounds? 2. Does Smelleze Pouch has a MSDS for reference? 3. Is there any vendor or retail in Canada carries Smelleze product line? 4. How much and how long it will take for shipment to Scarborough of Ontario with postal code of M1V 5P4? Hope forward to hearing from you soon. 1. I would recommend our Smelleze™ Reusable Hospital & Medical Smell Deodorizer Pouch for odors of rotten cancer wounds. 3. We do not have any stores in Canada or anywhere that sells smelleze products. 4. Depending on how many pouches you order it will be it will be around $20 for shipping and take around 10 days.